How about we start out the new year with a Book Giveaway? I’m really excited to introduce you to my friend and fellow writer, Lindsay Frucci. 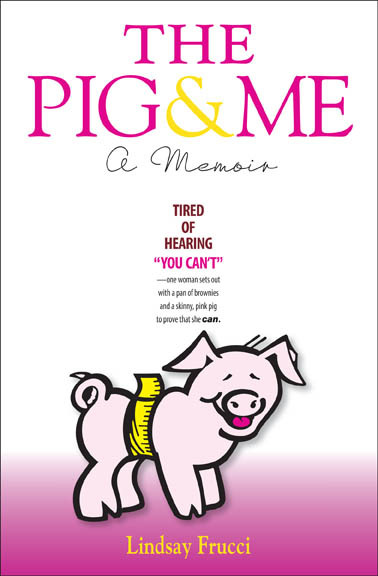 Lindsay is the author of The Pig and Me, in which she chronicles the journey of creating a low-fat browmie mix that would ultimately pull her family out of financial crisis. And what a roller-coaster ride it is! Lindsay’s book is an inspiring page-turner that I know you’ll love! I’m so certain, I’m giving away two free copies!!! Just leave a comment by January 15th! Winners will be chosen by random.org and notified via email. Lindsay was so tired of hearing “You can’t” and decided to do something about it, how about you?